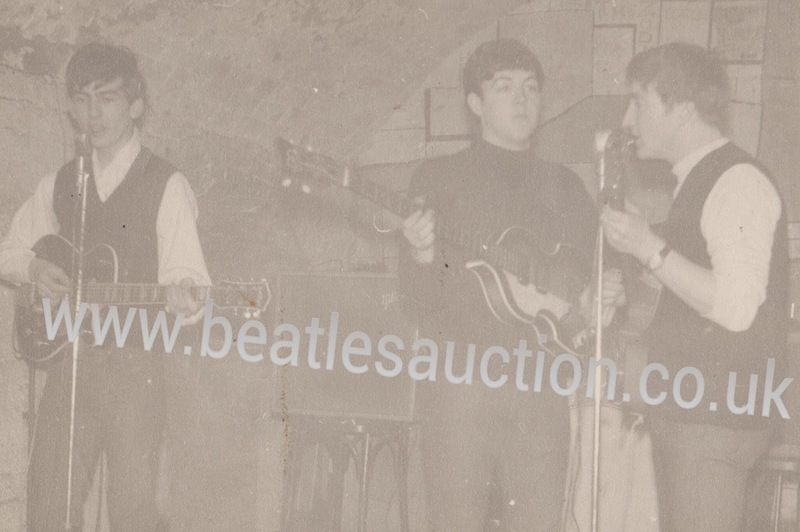 Liverpool Beatles Auction: Unpublished Photographs of The Beatles in the Cavern Club! Unpublished Photographs of The Beatles in the Cavern Club! Last week we had a ticket that we'd never seen before and this week we are thrilled to have come across two rare, unpublished photographs of the Beatles in the Cavern Club. The images show the boys in the Cavern in early 1962. Paul is in a black roll neck top, George and John are in shirts and sleeveless pullovers. The drummer isn't visible in the photographs but it is Pete Best's drum kit. The vendor, who cannot recall how she obtained the photographs, later got them both signed on the reverse by the Beatles. This would have been after August 1962 because Ringo has signed. Paul McCartney has signed for John Lennon in both cases. Finding previously unseen items is always exciting and proves that you never know what you have stored away somewhere. The image of one of the photographs below is edited and marked in order to protect the value of the photograph. The estimate for the photographs is yet to be confirmed. They will be sold as two separate lots.